Sarah Miles, a professional singer/songwriter who has the distinction of being the youngest child ever admitted to New Jersey’s prestigious Westminster Conservatory Children’s Choir, runs Sing-along with Sarah. Her music has been featured on NBC’s “The Voice,” and her latest album, “One” includes folk/pop-inspired music. In addition to all of this, she’s available to perform at your next children’s birthday party or playgroup! For birthday parties, Sarah will come to your home or event space with her guitar and other instruments for your child and all his or her friends to have a fun, music and dance experience. For an additional cost, Sarah will write a custom song about your child, based on what you have to say about them, to have forever. Parties are tailored to a variety of age groups including babies and toddlers and ages 5-12 years, and typically last 45 minutes to an hour, but can be designed to fit your needs. Her repertoire includes age-appropriate music custom selected to keep everyone entertained. For example, if you’re hosting a party for babies and toddlers, you will hear all the classics from the “Isty Bitsy Spider” to “Down by the Bay,” and more. For older kids she’ll include some of the latest chart-topping music from artists such as: Katy Perry, Taylor Swift, Kelly Clarkson and others. Of course, if there’s a special song you or your child would like to have her perform, she’s happy to learn it ahead of time, unless she already knows it! If you’re looking for a different kind of play date, Sarah will also come to your home or even outdoors, weather permitting, and conduct a sing along playgroup. This is a great way to incorporate music into your child’s life and a sure way to keep everyone happy and not have them fighting over toys! Pricing can also be split between parents to keep costs low. For more information on pricing and availability please visit the website or email Sarah directly at bookingssarahsingalong@gmail.com. 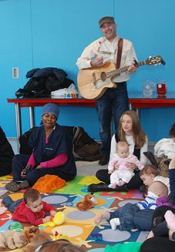 Veteran children’s birthday entertainer, A Singalong with Ryan, is one of the most sought-after children’s entertainers in New York City. He gets his audience singing and up on their feet, and kids are drawn to him and his great personality, no matter their age. With guitar in hand (and other instruments at the ready) Ryan will perform everything from children’s classics such as “Wheels on the Bus” and “B-I-N-G-O” to current chart toppers and even favorite children’s television theme songs. And of course, Ryan will stick around and lead the party in a Happy Birthday song for the star of the show. And for an additional cost, Ryan will write a custom song for the birthday child based on information you provide him ahead of time. Classic Sing-alongs typically last 30-45 minutes and are most appropriate for ages 0-4 years. Ryan is also available for playgroups in your home or even outdoors in the park. Ryan plays his guitar and provides other instruments for the kids to sing along and dance to all their favorites. Like the Classic Sing-along parties, playgroups are best suited for ages 0-4 years. Book in advance because he’s busy! For booking and other general information please email Ryan at asingalongwithryan@gmail.com or call him directly at 646-373-5550. Click to edit section 26852 4 0 Rockin' with Andy! If you want to have a sing-along birthday party or playgroup for your child, but don’t think you can stand hearing “Twinkle, Twinkle Little Star” one more time, then you need to contact Andrew Baum with Rockin’ With Andy! Oh, he’ll sing all the classics, but he’ll also incorporate songs adults can sing along to as well. For example, he may start singing “You are my Sunshine” and breakout into “You are the Sunshine of my Life.” And he loves to sing classic pop songs from eras gone by such as The Beatles and others to be mindful of parents and caretakers who need a break! No worries, though, it’s all about the kids! With a suitcase full of egg shakers, bells, scarves and a ton of animal puppets to make it a great interactive experience for the kids, Andy performs classic children’s songs geared towards preschoolers for 30-35 minutes typically. As an added bonus for parents, he performs what he calls his “jukebox” of favorites that are sure to make adults have no regrets for attending yet another weekend birthday party! Because he performs in a 70s cover band, parents are sure to have just as much fun as their kids. Andy is also available for private playgroups and even sells them in packages of 12, scheduled how you need them to work best. Playgroups typically last about 45 minutes and minimums of 8 children are needed. You can host the playgroup at the same location each week or time, or you can rotate locations to suit your needs. For information on pricing, availability and bookings please visit the website. Contact Andy directly at info@rockinwithandy.com or call him at 917-647-3611. With the ability to spread out all over the tri-state on the same weekend, Jam with Jamie is a group of talented young musicians with varying musical backgrounds. Head Jammer, Jamie, has been working with children of all ages as an actress, teacher, and entertainer for the past ten years. All of their parties and playgroups are a great time for kids and adults and they encourage everyone to jam out with them and have a great time! Geared towards children ages 0-6 years, Jam with Jamie offers two different birthday party packages: Classic Jam – one entertainer performing a 45 minute party for up to 20 children and Mega Jam – two entertainers performing a 45 minute party for more than 20 children. Both parties include props and instruments such as shakers, bubbles, parachutes and more. Rates vary by location and size. Jam with Jamie also offers several birthday party add-ons (additional fees) such as: an adult-friendly playlist of music for when the kid’s jam session ends, and a custom birthday song with lyrics and CD provided to the special birthday boy or girl. If you’re looking for a fun playgroup option to have in your home, Jam with Jamie has several to choose. One entertainer will come to your home for a group of friends and bring props and musical instruments. Playgroups last about 30-40 minutes, depending on the age group, and run on an 8-10 week cycle, but they can be flexible to meet your needs. Other services include guitar, piano, ukulele and voice lessons for ages 3-7 years. For more information please see the website. For information on pricing, availability and bookings please visit the website. Contact Jamie directly at Jamie@jamwithjamie.com or call 917-822-0186.